When I started running back in 2011, I didn’t really have a goal other than being able to run a few miles at a time, a few times a week. My best friend was doing races like half marathons at that point, but as a new runner they were never a consideration. During the two years of the vicious cycle of slow progress and injury setback, a 5K seemed the only reasonable distance I would ever achieve so I never really considered anything more ambitious. But as my training started to build momentum over this past summer (2014) and I was training for my first 10 mile race, the idea of a longer distance started to percolate in my mind. I found I was really enjoying my long training runs on the weekend and since long runs are meant to be slow, they suited my pace. I was also really enjoying planning my long runs and would plan routes into Manhattan and back to keep them interesting. There was also all this marathon training talk going on at the time. 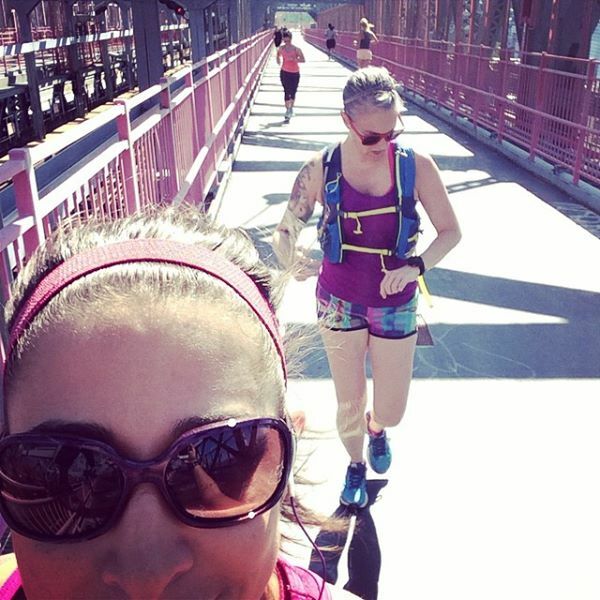 Many of my friends were training for the NYC Marathon, my local running group–North Brooklyn Runners–was abuzz with marathon training chatter as was my online running team–The Sub-30 Club–as runners were preparing for Chicago, NYC, and Philly marathons. I found myself disappointed that I wasn’t able to join in on the even longer runs and the training chatter. 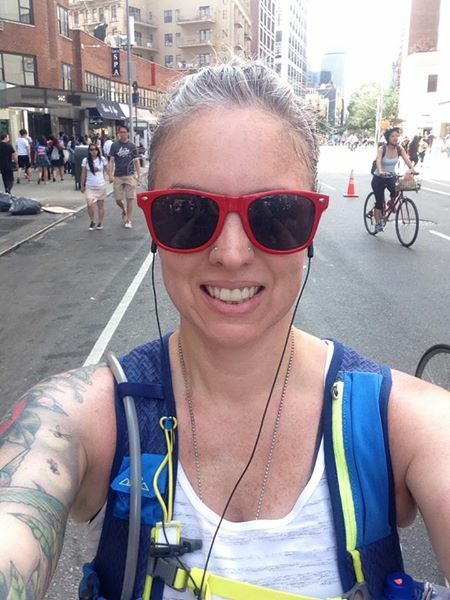 Running up Fifth Avenue during Summer Streets on my first 7 mile training run. On a 9 mile training run for my 10 miler. 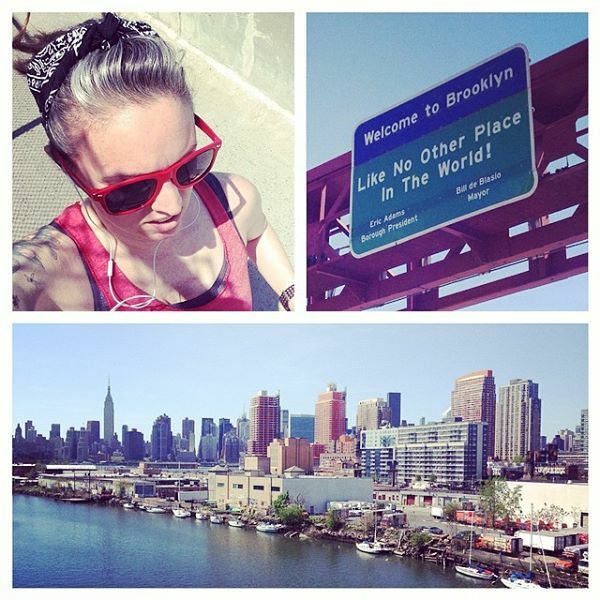 I planned to cross one bridge into Manhattan, run back to Brooklyn over another, then run back to my neighborhood. Two friends who were training for marathons joined me. 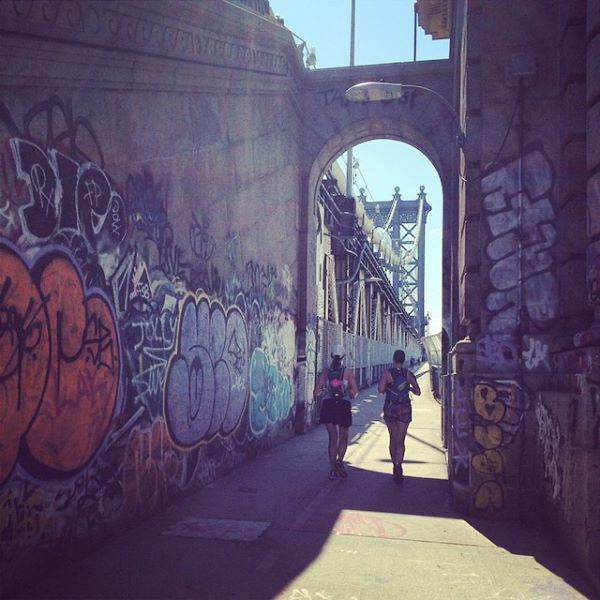 Heading back to Brooklyn on our 9 mile training run. My friends were doing 10 and 12 miles that day for their marathon training. In addition to the consideration of longer distances and longing to join my friends in their training, I was contemplating the possibility of moving from NYC at some point in the next couple of years. Living in NYC I am able to participate in a guaranteed entry program for the marathon that requires you to complete 9 qualifying races and one volunteer shift. If I ever wanted to run NYC, this would be the “easiest” way to get guaranteed entry and therefore not have to leave my entry to chance through the lottery. It was late in the year though, almost September, and I had travel plans for two weekends in October. Were there enough qualifying races left? I had completed 3 races already–that first 5 miler, and two others that I had integrated into my 10 miler training plan–but with my travel two weekends in October, it would be close. I signed up for 4 races with the final race being on December 31st and also selected a volunteer shift handing out race bibs at the marathon expo. There were just three other qualifiers that I could have actually ran including a half marathon which I wanted to run, but didn’t think I would be ready for in time. For some reason I didn’t even think about throwing an extra race on as insurance. I kept my 9+1 goal mostly to myself. I figured if I wasn’t ready by the time registration came around or by marathon time, I could defer to the following year. Not telling anyone would allow me to defer without peer pressure. 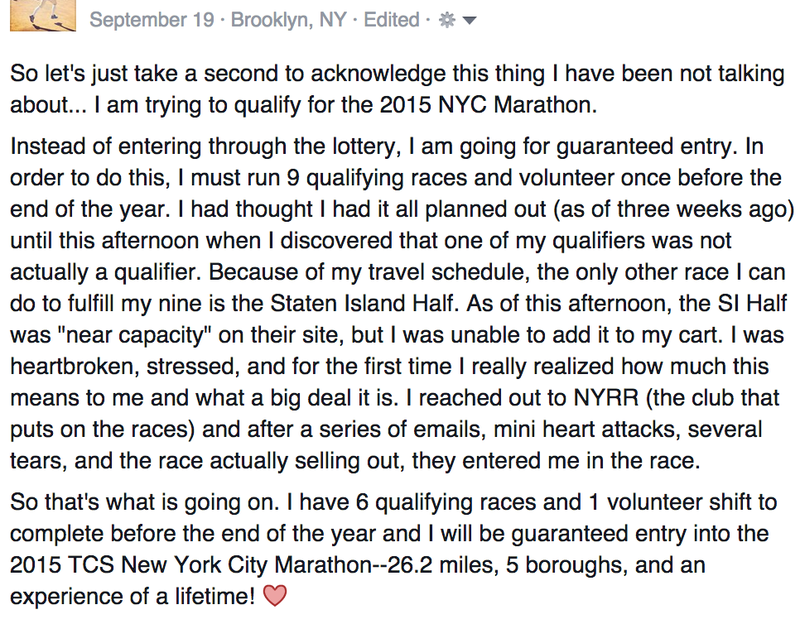 Then one afternoon in September, for some reason, I decided to just confirm that all of my races were qualifiers. I am not quite sure why as I had studied each of the races before I registered for them. That’s when I saw it. My last race was NOT a qualifier. I frantically looked at the race calendar to search for another race. There was just 1 left that I wasn’t registered for and could actually run because of my travel schedule. It was that dang half marathon. But was it available? The site said “Near Capacity.” I breathed a small sigh of relief and started my registration. For some reason the race wasn’t available for registration, though, even though it didn’t say “Sold Out.” I emailed the running club. Via email I was informed the race had sold out. I pleaded my case–the last race had been a qualifier, but then changed! Not so, they said. The site said the half marathon wasn’t sold out! It sold out while I was emailing. I was heartbroken. Then a glimmer… the person on the other end of the email told me that they tried to register me, but my credit card info on file was incorrect–could I correct it? COULD I?! I updated my information like my life depended on it. Then silence. I cried. I paced. I prayed. I chatted with a friend who despite all of her attempts to calm me with logic, failed. I felt like I couldn’t breathe. I felt like I may vomit. Then I saw it. “NYRR Order Summary” was the subject line. I could finally breathe. That afternoon I came to realize just how much this marathon thing meant to me. This wasn’t some casual thing that I was going to defer. The thought of having to wait another year to complete my guaranteed entry and pushing off the marathon to 2016 was scary. If I was that upset about the possibility of it slipping away for a year, it was big. And it was something that shouldn’t be a secret. Declaring my intentions on Facebook. 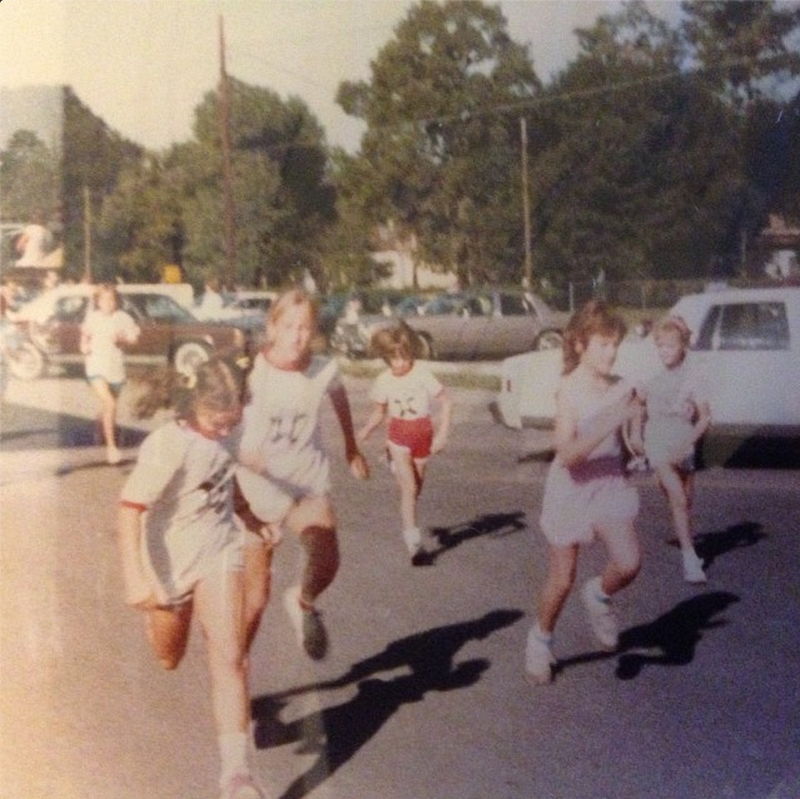 I ran a little cross country in the milers club in elementary school. I never really got into it seriously and I wasn’t particularly good at it. When my family moved to a different city in 5th grade, I didn’t pursue running or softball which I had played for many years. Instead my focus turned to dance and eventually digital arts. After high school, I didn’t do much stay active. By 2009, I was overweight and trying to slim down. I tried to run a few times in September of 2009, but quit because of chest pain. (Even though a cardiologist had told me I was fine to run with my slight arrhythmia.) I was finally able to drop the extra weight in 2010 with diet and moderate cardio. That’s me with in the red shorts with the goofy stride. Form was obviously not my forte. In April of 2011 I moved to New York City. For the first few months of living in the city, I suffered from knee pain because of all the walking that had been added to my life. I was trim, but I wasn’t fit. 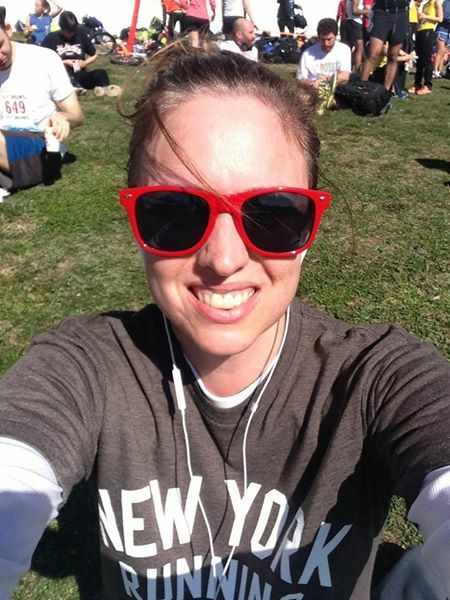 As Summer started to turn to Fall that year, I started to toy with the idea of running again. 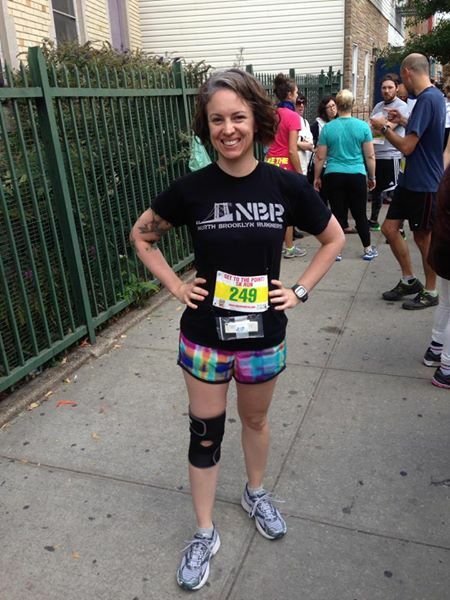 My best friend was running and doing some pretty cool races and my knees seemed to have adapted to the walking. So on September 8th of 2011, I headed out for a run. My first run was horrible. I wasn’t even fit enough to run a full block. I did almost 4 miles that day, though, in run/walk intervals. My best friend expressed her concern with my bold inaugural run and lack of proper shoes. So I bought a pair of Brooks Ghosts and started Couch to 5K. I also set a first goal race for December of that year. I won’t bore anyone with the details, but suffice it to say that I wasn’t ready for that race. It would take almost 16 months and three more races before I could run a full 5K. It was 16 months of a vicious cycle — slow progress and injury setback. It constantly felt like one step forward and two steps back. I could only run 2x a week, had to run super slow, had to wear a knee brace, and even that didn’t guarantee my knees wouldn’t act up. After the first 5K I was able to run the entire distance in March of 2013, I gave up running. My knees just didn’t seem to want to do it and I would be able to end on a high note. I was heartbroken, but resigned myself to the fact that being able to walk at 60 was more important than a hobby. 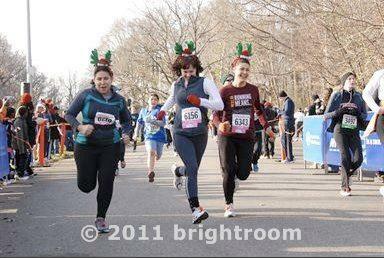 My first race in December 2011. I had to walk most of it, but ran through the finish. Obviously form was still not my forte. After the first 5K I was able to run entirely. March 2013. I felt invincible. Until I tried to return to training and my knees disagreed. Around the same time as that last 5K and me quitting running, I took up a new hobby–indoor rock climbing. For the next few months I was at the rock climbing gym several times a week. I was horrible at it, but I loved it. It was mental and physical and social and everything I wanted in a sport. But by mid-Summer, I was missing running. I decided to give it one last very conservative try. 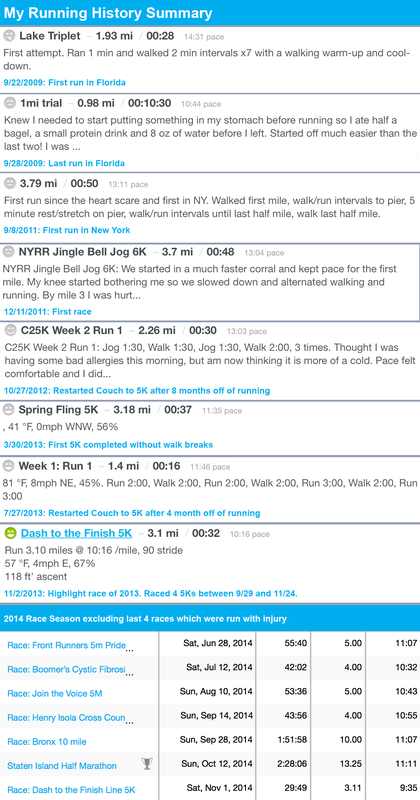 I restarted Couch to 5K on July 26th of 2013. I also signed up for a race at the end of September. I was amazed at the difference this time around. Something had happened. My knees weren’t as angry. Eventually I was able to start running 3x a week albeit at very low mileage (<5mi/week). By September I felt good enough to sign up for a few more races. I wasn’t running fast, but I was running. And I started to put two-and-two together. My climbing had made me strong enough to run. 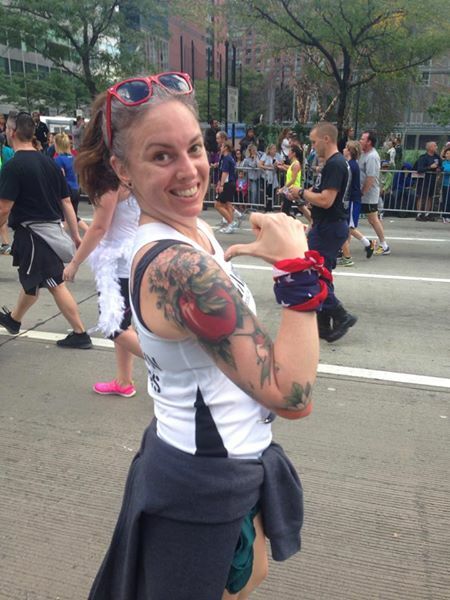 Feeling strong after the Tunnel to Towers race in September 2013. The race started in Brooklyn and ran through the Brooklyn Battery Tunnel to Lower Manhattan and ended at the World Trade Center. At a neighborhood race a few weeks after the Tunnel to Towers race. It wasn’t long after this that I was able to run without my knee brace. I continued to run through the end of the year, eventually ditching the knee brace. I picked up a Garmin watch and heart rate monitor in December (2013) and planned to do base training through the Winter. By Spring, I was running 3x week up to 2-3 miles at a time. My weekly mileage was still pretty low at 5-6 miles per week, but I wasn’t really training for anything either. 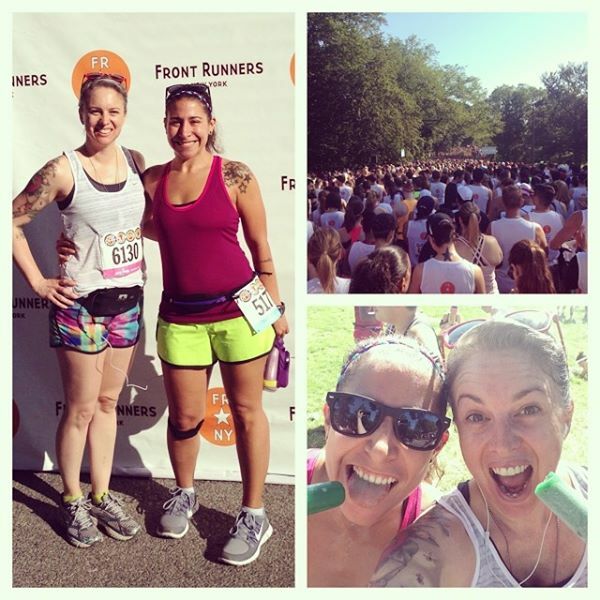 So I signed up for a race–The Front Runner’s 5 mile Pride Run on June 28, 2014. The distance seemed out of reach, but I figured I could always run/walk to complete it. I found a 10 week training plan and passionately focused on my new goal. 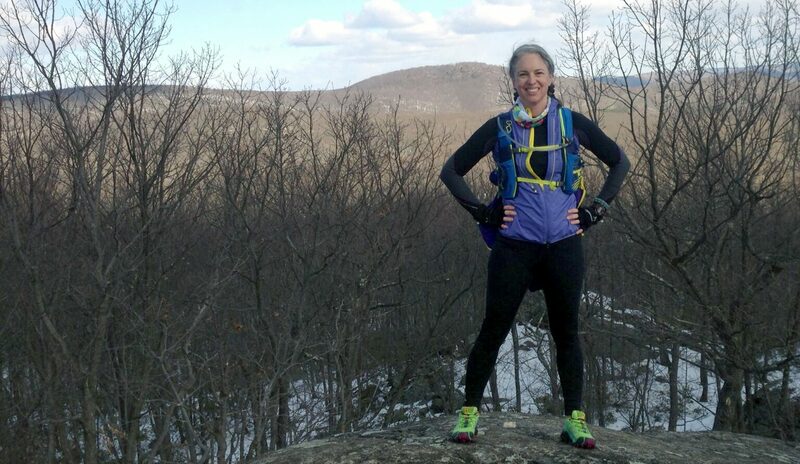 I supplemented my running with rock climbing a few times a week and 20 minutes of yoga after every run. I had also incorporated some PT exercises for my knees. Again, I wasn’t running fast, but I was running. I was adding miles and staying healthy. I couldn’t believe it. I completed the race and for the first time, I felt like a REAL runner. After I got home from the race, I immediately signed up for a 10 mile race at the end of September. Training for the 5 mile race with some bridge running. Before and after the 5 mile race. I ran well enough for the first 4 miles that I was able to really kick at the end.